Apple Watch has come a long way since it was first introduced in 2015. Today, we met the culmination of the last two years (has it really only been two years?) in the Apple Watch 3. This is Apple's first LTE connected smartwatch, though there's also a standard model that lacks LTE. Both went up for pre-order on September 15, and go on sale September 22. If you go the cellular route, you'll be able to perform a number of tasks on your Apple Watch 3 without your phone nearby, such as making calls and streaming 40 million songs from Apple Music. You can leave your phone at home while you go about your business, yet stay connected and experience no dip in your Watch's functionality. LTE makes the Apple Watch 3 the first Apple smartwatch that I'm genuinely interested in buying. Interested, yes, but ready to commit? That's a slightly different matter. My thinking on the Apple Watch (and smartwatches in general) has been: yes, they are neat, but if you need a phone to get full use out of it, what's the point? There are smartwatches with LTE already, such as the LG Watch Sport, Huawei Watch 2 and Samsung Gear S3. I've steered away from these for several reasons, including their size, style and because I use an iPhone as my primary phone. I've had my eye on the Apple Watch 2, yet despite marked improvements over the first Apple Watch, it's always felt superfluous. I could never justify the purchase - why buy another device that can't even function fully without an iPhone close by? The Apple Watch 3 changes the game for me. I'm not a big phone talker - who is anymore? - but when I factor in that I could make and receive calls on my Apple Watch 3 and perform formerly iPhone-reliant functions in addition to the watch's other eye-catching features, it starts to sound a lot more appealing. Here's something I wouldn't feel completely guilty buying. While giving up my phone isn't an option if I took the Apple Watch 3 plunge, I would be able to leave it behind if I chose and not feel like I'm wearing an expensive chunk of useless metal on my wrist. It's freeing to go out without a phone, yet that's not always a good option. I regularly go for long walks, jogs and hikes, and bringing my phone often feels like a necessary burden. It'd be great to not have to take it, but the need to make a call if something happens or listen to motivational music outweighs this desire. With the Apple Watch 3, I wouldn't be faced with this choice (though I would have to buy a pair of Bluetooth headphones). Aside from LTE, there's not much separating the Apple Watch 3 from the Apple Watch 2. There is a faster processor in the new model, which should bring a welcome boost to performance, and battery life should be improved when not using LTE. Oh, and the digital crown has a red dot on the top now. I'm not too bothered by the lack of standout new design changes on the Apple Watch 3, particularly because it keeps the size of the Apple Watch 2 while packing more in. Where my hesitancy starts to creep in is price. The Apple Watch 3 with LTE costs $399/£399/AU$559, and that doesn't include carrier fees. US carriers are charging $10 a month for Apple Watch 3 cellular service. This adds up to $120 a year, on top of what you paid for the watch, plus your regular phone service. Verizon, AT&T, Sprint and T-Mobile are offering three free months of service, so that delivers some savings. These offers, however, won't last forever. 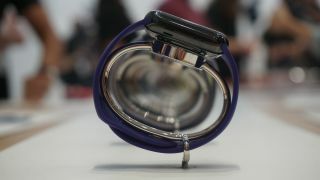 The price of connecting the Apple Watch 3 LTE is big, and it's a factor I'll have to consider before committing to the new Apple Watch for good. So far, though, it's done plenty to convince me it's worth at least trying on.